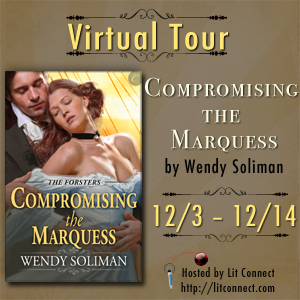 Today, Love Saves the World welcomes Wendy Soliman who is currently on tour for her book, Compromising the Marquess. One randomly drawn commenter from each tour stop will win one digital copy of COMPROMISING THE MARQUESS. The giveaway is open internationally and the winner will be notified via email after the close of the tour. To visit Wendy's other stops, click here. LStW: Since your new novel is about newspapers, I’d love to know what’s the first section you read when you get your paper. Wendy: My horoscope, of course. Seriously, though, I was an avid reader of the papers in my younger days, cover to cover stuff. I felt it was so important to be informed. Then I wised up and realized that the more things change, the more they remain the same. Politicians make the same promises today as they did in the days when I actually believed them. When I’m back home in England I so enjoy the Sunday Times. It’s like a mini-novel and takes the whole week to get through all the sections. I particularly like their in depth review of the arts. LStW: Compromising the Marquess is set in Regency England. What’s your favourite thing to write about that historical period? Wendy: I wrote my first novel when I was in my early twenties and, guess what, it was set in the Regency period. It then languished in the back of a cupboard for years. When I started writing seriously I resurrected it and used the plot in a book that was released by an English publisher. Moral of the story, never throw anything you write away! To answer your question, I was brought up on the Isle of Wight in southern England, a stone’s throw from Osbourne House, Queen Victoria’s Island retreat. Carisbrooke Castle, where King Charles 1st was imprisoned before being taken to London and executed, is five miles away and we have more stately homes and ancient ruins than you can shake a stick at. I guess I absorbed my love of history a bit like osmosis without being aware of it, and it’s never left me. Besides, I like the idea of gentlemen in tight breeches with protective instincts and fastidious manners in public, regardless of how they might prefer to behave in private! LStW: You’ve written both contemporary and historicals, suspense and romance – what’s the greatest challenge about switching genres? Wendy: Remembering what language to use. Sometimes my contemporary novels seem a little stilted, until my editor gets her hands on them, because I’m still in the Regency inside my head. Research is also an issue. If you want someone to travel a distance that might take a couple of hours in modern times, you need to be aware that it would probably take more like a week in the Regency, so you can’t have people flitting from place to place at the drop of a hat. Perhaps that’s why they stayed for weeks or even months when they went to visit people. LStW: What’s next for Wendy Soliman? Wendy: Carina Press have contracted all four in the Forsters’ series. The second, Beguiling the Barrister, is Lady Felicity’s story and comes out in June 2013. I’m working on Finessing the Contessa, which is Rob’s story, and have already started plotting Gabe’s inside my head. Well, I have to occupy my brain somehow on those long walks I take with my dog. Leah Elliott and her sister Bethany remove to the south coast, where Leah makes a living by picking up tidbits of gossip for a scandal sheet about the local family of consequence, the Forsters. She erroneously reports that the marquess, Hal Forster, is about to marry a local lady. To make up for her mistake, Leah offers to act as Hal’s paramour. In return he agrees to educate her in matters of romantic love, acting out scenes from Fanny Hill, a book which they have both read. Leah discovers that Hal has a young Frenchman hidden on his boat, which makes her suspicious. During a grand ball at Forster Hall, the Frenchman kidnaps Leah, using her to lure Hal into a trap. Using her wits, Leah manages to warn the man she has fallen in love with that he’s in deadly peril. Managing to overcome his foes, Hal concentrates on discovering the truth behind the fire that killed Leah’s father and supposedly destroyed the rare books he so treasured. His efforts lead them both into more danger when they have a deadly confrontation with a scoundrel at an inn in the backstreets of London. Deeply in love with his feisty scribe, Hal proposes marriage. Leah realizes that true love simply doesn’t recognise the class divide invented by society and joyously accepts him. 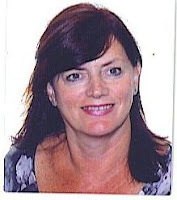 When not writing she enjoys reading other people’s books, walking miles with her dog whilst plotting her next scene, and is on a one-woman mission to save the wine industry from the economic slump. Well, some- one’s got to do it! To win a copy of Compromising the Marquess, just leave a comment, along with your contact details, saying what you enjoy most about Regency romances. I love so many things about regency romances. I love the gowns and balls. The lords and ladies are always fun and I love all those quirky society rules that were just made to be broken. I love the elegance of the period the speech: the people, the clothes.... everything is! I love that the simplest & smallest thing is romantic; a touch of fingers; a caress on the cheek. Just makes me melt. Thanks for your interest and comments, ladies. Keep them coming. Hi, Lit Connect and Wendy! Hi, Jyl, bn and Linda! Thank you for dropping by and helping me welcome Wendy! I love the courtship rules & rituals of Regency romances. I like the rakes who break these rules too. Thanks for stopping by and leaving comments, ladies. Appreciate it. actually get webmasters and others to purchase your services. to help build their list. With rising gas prices, the cost of commuting has surged. The Smart - Step ribbon and instructions guide the user through the protrusion creation process in Solid Edge. One of the most useful buttons is the one that calls the on-screen keyboard.